18 series of Marvel Legends from ToyBiz. 27 series of Marvel Legends from Hasbro. Numerous box sets and exclusives. And we finally have an ML Thanos! 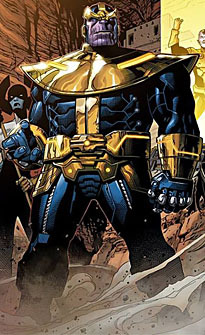 The mad titan called Thanos worships death, and seeks to destroy all life in the universe! Possessing awesome cosmic power, tremendous physical strength, and impervious to all but the most potent forces, he is truly a foe to be feared and respected. While often stymied by heroes from Earth, Thanos has never been truly defeated! 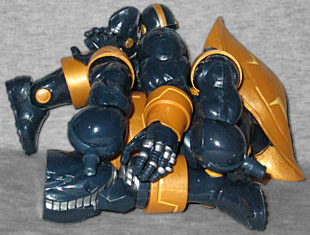 Thanos is the Build-A-Figure for Avengers 2: Tokyo Drift Series 1, and comes in seven pieces: legs, arms, head, torso, and shoulder-banana. If you buy all six figures from Series 1, you'll end up with an extra head and left arm, because both swap figures come with identical parts. All the pieces go together securely, and won't come apart again easily. Have you ever wondered why we constantly remind you that BAFs aren't meant to be disassembled? Perhaps some day we'll regale you with that story. Apparently some people are confused about whether this is the movie or comicbook version of Thanos. Well, his movie costume doesn't look at all like this, but the confusion is still understandable: since his introduction in 1973, Thanos has really only worn one outfit, and this isn't it. This design, with its more technological styling, armored spine, and silver accents on the front of the legs and the knuckles, comes from 2013's Infinity miniseries. Not a lot of people read that, so it makes sense that no one would know about Big Daddy T's new suit of clothes. This costume was designed by Jim Cheung, and the toy definitely takes its inspiration from his art. He's smiling, which is hardly a typical Thanos thing to do, but it is at least an evil, mirthless smile. He's got great wrinkles on his chin, and dark black eyes with blue pupils. It's a good thing you end up with two heads, because the paint gets sloppy easily. The toy's articulation is not good. The arms are fine, because the soft wrist armor flexes out of the way when you move him. The chest hinge only has one "click" of motion, giving him almost as much of a difference between "bent" and "upright" as the average airline seat. His hips are even more limited than Spider-Man's, and for the same reason: the hip sits too close to the body. His legs only move out to the side about 6°. But then again, what pose are you trying to put Thanos in that requires his leg be sticking straight out sideways? 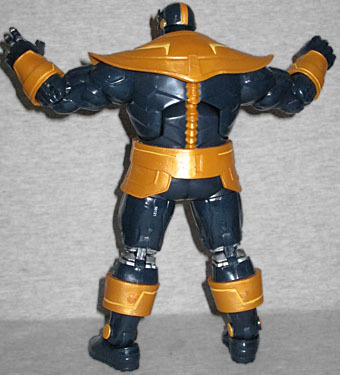 The lines on Thanos' boots are higher on the insides than the outsides. We'll repeat that: higher on the insides than the outsides. If you see a Thanos with the lines some other way, they're wrong and need to be fixed. When I was getting ready to assemble Thanos, I found that both boots were done the same way: high line on the left, low line on the right. After a quick boil-n-pop, I discovered that the legs weren't misassembled (the insides are marked with L and R, and tabs on the inside of the yellow ring ensure it only fits on one way). So what happened? 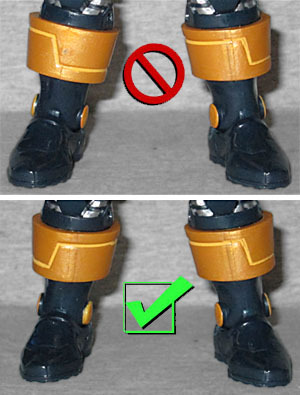 The shin swivel and swivel/hinge ankle mean you can turn the lower leg completely backwards without noticing, and it also means you can fix Thanos without pulling him to pieces! Unless you're a dummy like me. Thanos only stands about 7⅜" tall, which seems small for him. The sculpt looks very nice, but the paint is only so-so, and the articulation leaves a lot to be desired. 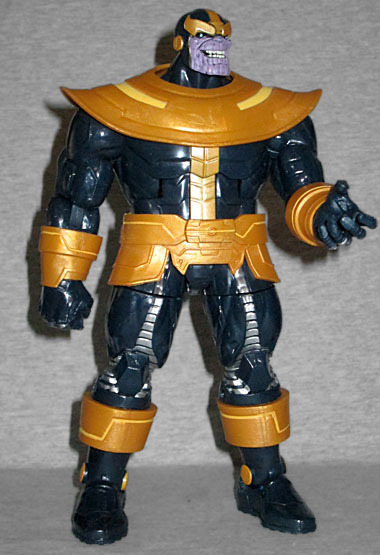 Honestly, unless you're already buying all the Avengers Marvel Legends, ignore this Thanos and get the Marvel Select Thanos instead.